In a debate with Neil Cavuto, uber socialist activist, Darletta Scruggs, comes up severely lacking. Cavuto schooled her nine ways from Sunday on capitalism. 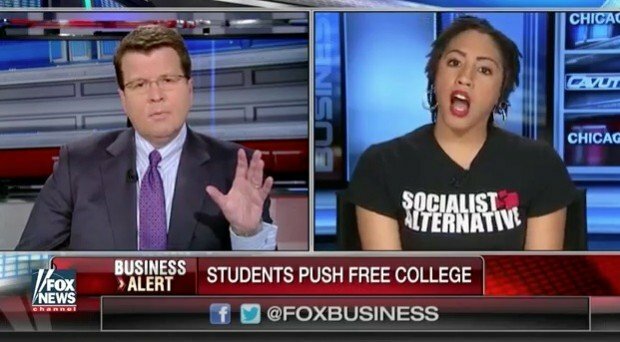 On Fox, Neil Cavuto squared off with the “Million Student Martch” organizer as she called capitalism illegitimate. She claims our government has to reassess their priorities and instead of spending so much money on war, the military and nuclear arsenals, they should spend it on education. One guess who her presidential candidate is… Bernie ‘commie’ Sanders. Our intrepid socialist radical did not do well up against Neil Cavuto. Free education. Free that is, except that the taxpayers would pay for all of it a la Bernie Sanders. I’m sure it’s an idea that Vladimir Putin, Iran and China wholeheartedly approve of. All these nitwits can get an education as we are invaded and taken down by our enemies. They’ll be the best educated zombies in the gulag. All of them are math challenged and in search of a communist utopia. It would be laughable if it weren’t life and death. Cavuto pointed out that the U.S. national debt is currently at $19 trillion, and her candidate of choice, Bernie Sanders, has admitted that these massive changes to the educational system can’t be made without increasing taxes on both the wealthy and middle-class Americans. Scruggs agreed with Cavuto that it’s important not to just raise taxes, but also to see how those tax dollars are being spent. I’ve heard this argument a million times and it never, ever gets any saner. She wants to punish Wall Street and big business… the very ones who employ people and pay wages. But she never quite thinks that far. She’s just not that deep. I hate to break it to this commie, but education, shelter and healthcare are not guaranteed rights. If she lived in the real world and actually worked for a living, she might get a clue. Probably not though… she’s so brainwashed and indoctrinated that all she is good for is being a useful idiot. Cavuto pressed Scruggs on what her ideal tax rate would be. Scruggs replied that she wants to see taxes raised for “those who are making billions of dollars” and “Wall Street bankers. Billionaires, not millionaires,” Scruggs said. Sanders wants a 90% tax rate on some individuals and businesses. In fact, I’m sure he’d be down with a 100% tax rate. 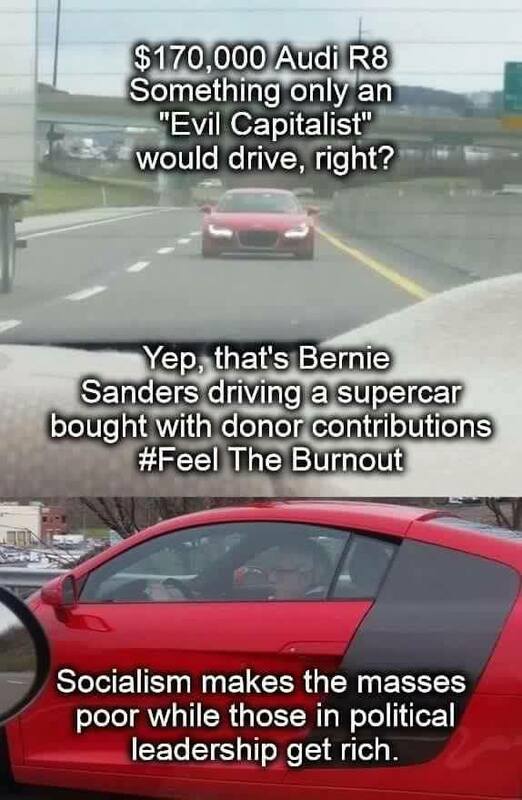 Bernie’s socialism makes the masses poorer, while the elitists in control get filthy rich. Feel the burnout.